While traditionally our pet’s furniture and our living room couch are not one in the same, our limited space in the city makes the separation easier said than done. In an effort to resolve this potential conflict, Deesawat, a furniture company in Thailand, has recently released PET. 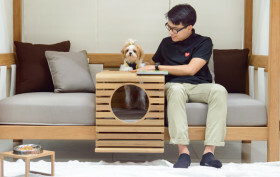 This innovative multi-use piece of furniture, not only includes a separate space especially for your pooch, but it is also moveable and weather resistant, making it easy to enjoy both inside and out.